The design intent was to create a series of outdoor multipurpose rooms on the property, located on a northern slope in a densely wooded area. As such, the house lot was quite dark and received a substantial amount of groundwater/runoff. 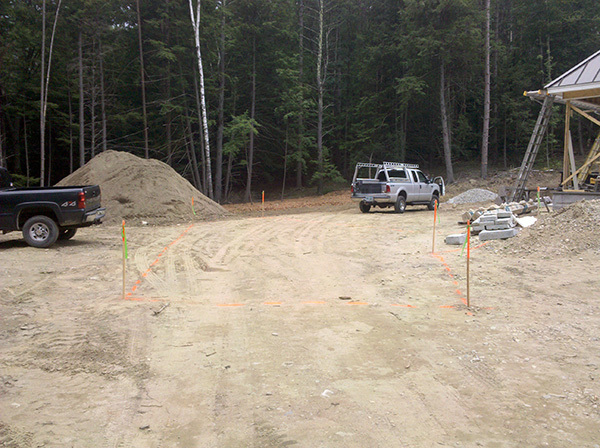 Due to poor soil conditions, the potential locations for a leach field were limited, which affected final driveway alignment and structure locations. 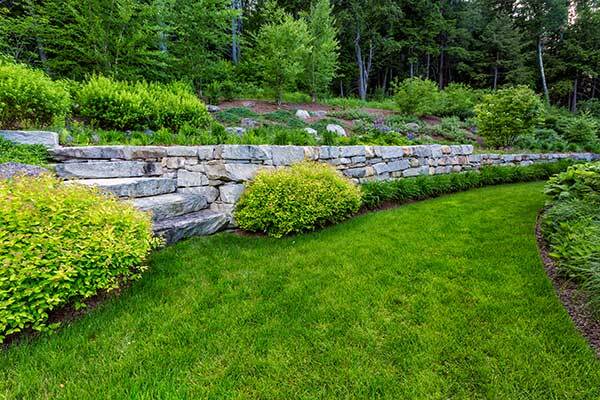 The Pellettieri Associates team selectively cleared trees around the site, installed appropriate vegetation to stabilize exposed slopes and used a natural stone retaining wall to capture subsurface drainage and reduce standing water. 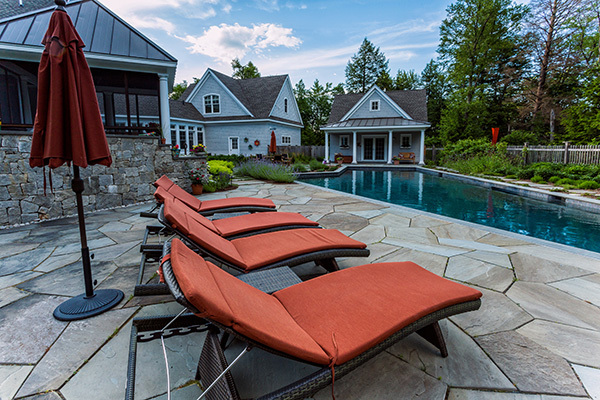 The outdoor rooms, including kitchen, dining, fire pit, spa, pool, open lawn and sledding hill areas, were designed with consideration for how they lead or connect to the primary residence and pool house. 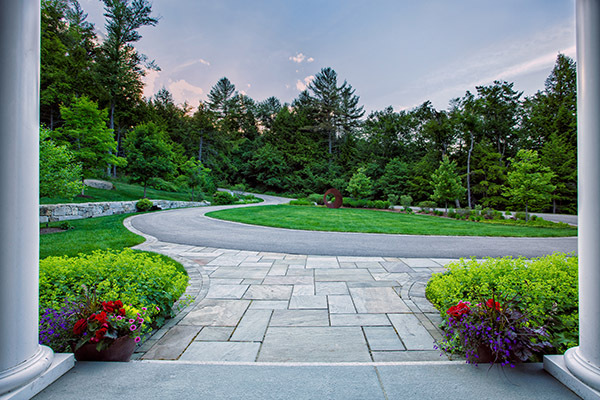 The project earned Pellettieri Associates a 2017 Grand Award from the National Association of Landscape Professionals’ Awards of Excellence program. new home, with a focus on a custom designed pool to the rear of the residence. 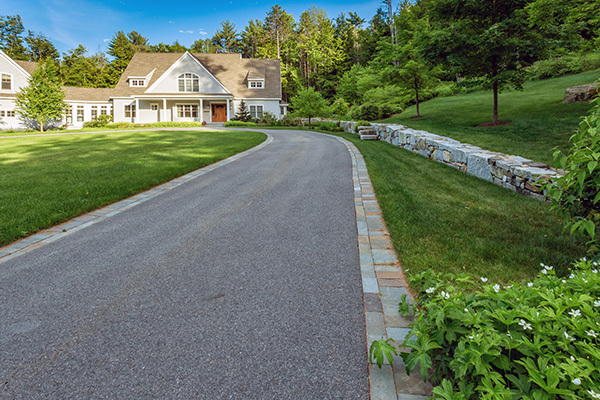 The asphalt driveway entrance shown was lined with bluestone brick edging. This photo is of the leach field being installed during construction. The leach field is located to the front of the home. To accommodate its placement, the proposed driveway alignment was adjusted. A loop drive at the front entry welcomes guests to front door and offers space for active recreation over the leach field. Stile steps provide access over the stone wall to the upper slope. This sculptural element offers a unique and playful feature for the family and guests. 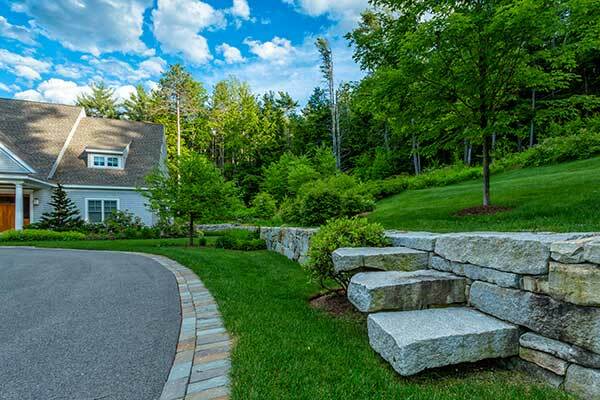 This granite and field stone retaining wall helps transition grade towards the house and intercepts groundwater before it reaches the structure. 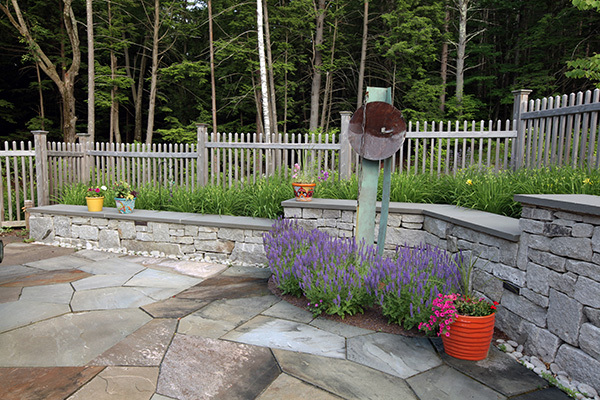 Steps lead to a fire pit on the upper slope. 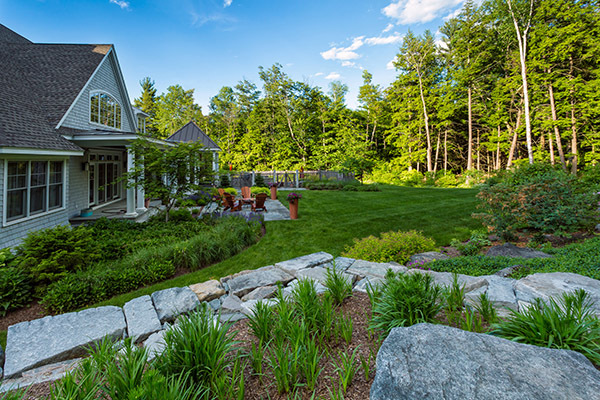 The backyard provides opportunities for both active and passive recreation. The home’s living room opens to an outdoor patio for smaller gatherings and provides access to the back lawn. 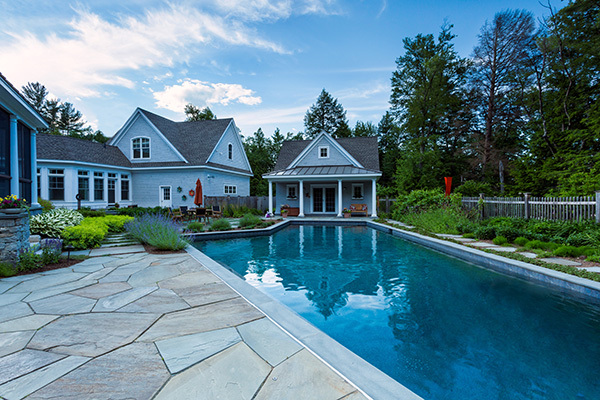 The custom pool is surrounded by multiple gathering areas, the pool house and utilities, which are well concealed behind fencing and vegetation. 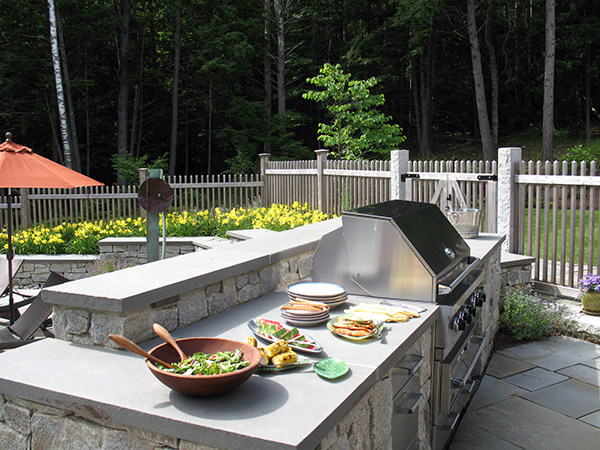 An outdoor kitchen is located adjacent to the pool. This area provides easy access to multiple patios and a screened porch. 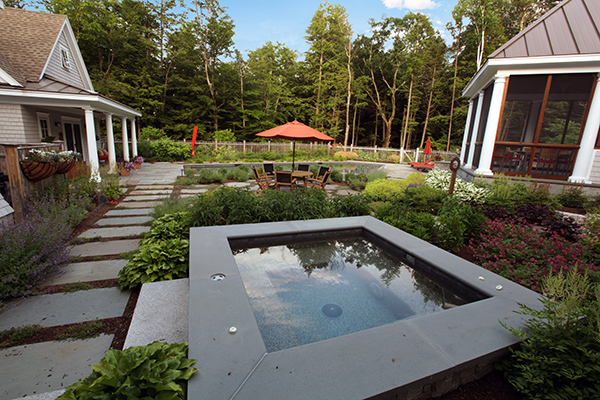 To provide focal points, sculptures were placed around the pool in planting beds. 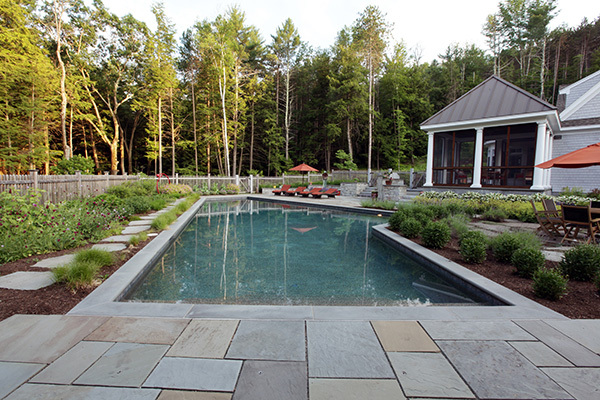 On-site pool layout for client approval. View from the pool house, which opens to the pool’s shallow end. The screened porch, outdoor kitchen and main patio are adjacent to the pool’s deep end. A gunite spa is located close to the house’s mudroom entrance for easy access and overlooks the pool, outdoor dining patio and pool house. 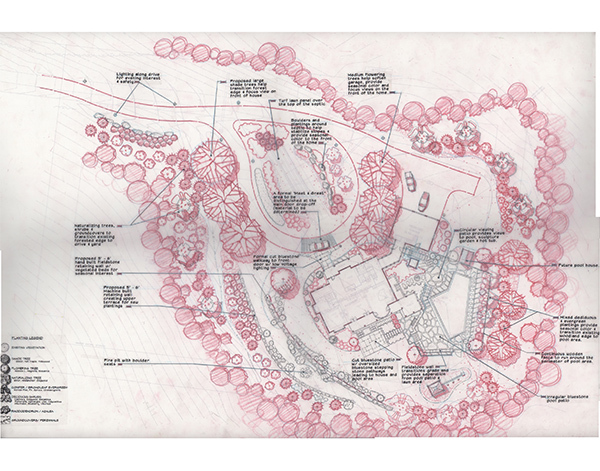 Conceptual master plan for the project.